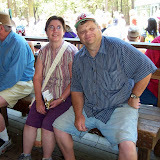 About 10 days ago I briefly previewed my upcoming vacation to Reno, NV for the 2007 USBC Open Championships and then my subsequent plans to visit Yosemite National Park along with family while basking in the days in which I didn’t have to go to work. Well, those time have come and gone and I’m back to work with new memories safely stored in my brain and in my camera. Two Sunday’s ago I headed out on the open road to Reno where I was meeting up with Lindsy, Kacy, and David Bonifacini along with John Staley for the team event at the USBC Nationals. Monday night we bowled the team event and Tuesday night we bowled Doubles and Singles. Unfortunately Flor was taking her final Tuesday morning so I was without her until Tuesday evening when she flew in to meet me for the week. For more on the actual bowling part of this trip see this post over on Mounts Bowling. Anyway, after finishing up with bowling way late on Tuesday night Flor and I went back to the hotel and called for a late checkout as it was around 2:30 in the morning. Wednesday we finally got out of the city around 2:30 in the afternoon and drove to Fresno where we spent time with my parents and prepped for a day trip to visit Yosemite National Park on Thursday. Wednesday ended up being a nice day and we had little trouble on the roads but that darned air conditioner on my parents wall might have been better off left off as it might have spelled the beginnings of a cold for Flor as she started feeling it a bit Thursday morning. Despite Flor and I both waking Thursday morning to slight scratchy throats we, along with my parents, headed up to Yosemite National Park for the day. This we determined was the first major place that Flor and I have visited that she had been to but I had not. We’ve done this the other way around a number of times and things that neither of us had done before but this was a first for us. It was a perfect day too. We arrived in the early afternoon and hiked up to see the Giant Sequoia Groves, had some late lunch in Wawona at the Golf Pro Shop snack bar and then drove out to Glacier Point. I thought this drive was amazing but somehow it put everyone else to sleep. At one point I could audibly hear both of my parents and Flor sleeping in the car as I wound up the mountain. We finished the day tour with a trip to the base of Bridewell Falls which I found to be the greatest thing in the world. Flor and I went rock climbing right up to the base of the falls and had a great time. This reminded me so much of my childhood as I was always out climbing on rocks near streams bouncing around… only this time I had a hot girl chasing me from behind. It couldn’t have been better. Finally we made our way back to Fresno… the long and scenic way and crashed hard that night. The next morning I awoke to my mom cooking me a birthday meal 16 days early. That’s right, we celebrated my birthday. We had Manacotti with peas and salad with Apple Dumplings for desert. We then headed out to get me fitted for a suit! My parents bought me a suit for my birthday; so cool. That Friday evening Flor and I finally left and drove to LA to visit her family and most importantly her dad for Father’s Day. As always we had a great time goofing off with her siblings, niece, parents, and grandma. We all had a great IHOP breakfast on Saturday and then a nice excursion to the mall and finally we began that last leg of the car ride back to San Diego. I swear that last leg was the longest. It was an awesome week and now I’m back to work and Flor's battling a cold but I'm going to get to relive parts of this experience at least a few more times as my real birthday approaches on the 2nd of July and I get my hands on my tailored suit on the 6th of July in Missouri for my cousin Jessica Mounts’ wedding and then later in July when I get my winnings check from the USBC Open Championships tournament. I’ve got a lot of good stuff to look forward to. And finally, the album of pictures for the week can be found below.